I had dinner with the sister in South Fremont. There’s a small plaza with all sorts of restaurants and a McDonald’s, just off Cushing Parkway and I-880. The plaza was pretty quiet at night; I’ve heard it gets pretty busy during the day as it’s near several companies. It was the first time we’d been to Bab Sang, so we Yelped for highlighted dishes before going there. The one dish that stood out was cheese corn. We’ve had corn with butter. We’ve had elote (Mexican corn on the cob with cheese, cayenne, and lime). But Korean cheese corn? What is that??? Corn with mayo, cheese, carrots, purple cabbage, and cucumber. The vegetables resembled coleslaw. Bab Sang’s cheese corn (콘치즈) was more on the mayo side than the cheese side. I expected it to be cheesier, with strings of melted cheese. However, it was still pretty good! We ate it all; my lactose-intolerant sister ate half of it! Korean restaurants serve something called cheese corn, which is basically corn baked with a cheese sauce that makes it gooey, crunchy, sweet, and salty. 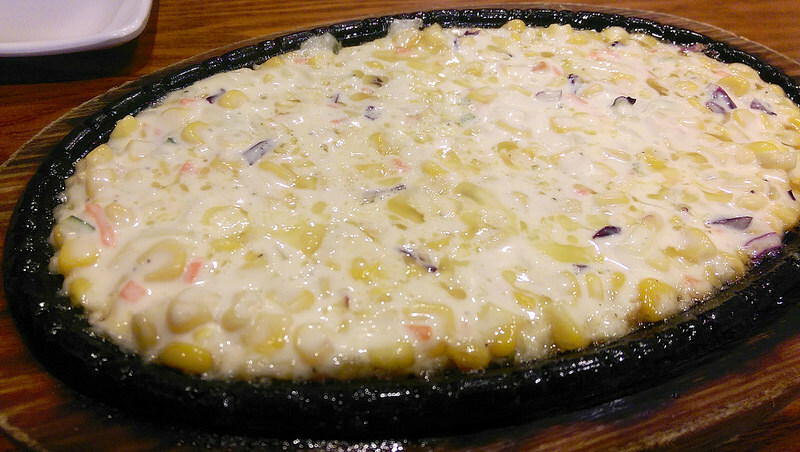 Corn cheese is a popular dish consumed with alcohol in the Korean culture. Let’s make it at the next LAN party!!! !